This is the shortest game ever played between masters in tournament competition. It ends in a knockout in four moves! 1. d4 Nf6 2. Nd2 e5 3. dxe5 Ng4 4. h3 Ne3! Instead of retreating, the Knight hurls himself into the enemy camp with an attack on the Queen. White resigns, as capturing the Knight would be answered by 5 ... Qh4, forcing mate. 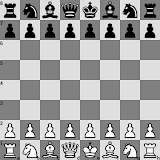 Game 1 from 1,000 Best Short Games of Chess, by Irving Chernev.